The subject that I am going to speak on today is very important for the future of both our countries: the United States and India. 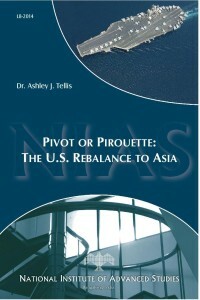 I am going to talk about the U.S. effort that is underway to rebalance to Asia. It is important because it goes to the issue of what kind of geo-political environment is going to exist in this part of the world in the years to come. If we do not quite get that context right, then obviously the choices that it will impose on all the states that inhabit this region will be far more difficult. Understanding what the United States is trying to do, I think, is a useful first step in trying to assess the future of the broad Indo-Pacific region. Therefore, I am going to focus my remarks on this subject: understanding the genesis, the phenomenology and the consequences of the U.S. rebalance to Asia. Rebalancing is really a strategic effort to go back to dealing with the fundamentals of the strategic situation. First, it is evidence of the American recognition that China’s rise is an enduring rise and not a flash in the pan. China is not suddenly going to disappear and take care of itself because of some internal crisis. It is the second element of rebalancing, the objective of managing China’s rise, which is going to be an extremely challenging one. Managing China is going to be a challenging task because it requires the United States to simultaneously socialise, integrate, deter and reassure China. Rebalancing essentially involves three components. The strategic component is the one which has acquired a lot of attention in the public discourse. The other two equally important elements are the diplomatic and the economic components. The idea, at the end of the day, is if all three components work as planned, the United States will begin to do much better than it did before in economic terms. That improved wealth and welfare performance will translate into greater availability of resources to the American state with respect to national defence. Those marginal increases in defence capabilities will in turn contribute to both defeating Chinese efforts to prevent the United States from being able to operate in Asia, while simultaneously reassuring American friends and allies. That, in a nutshell, is the logic of the strategy. One also has to remember that this is a multi-player game. There is a U.S. relationship with China, there is a U.S. relationship with partners, and there is a relationship between partners and China. There is also a relationship among the partners themselves, and some partners do not happen to like one another. For countries like India, Japan, Korea, and Australia, important nations that have proud histories and seek independent destinies, the success of U.S. rebalancing is vital. This is so because it is not yet clear to me that these countries have the capacity, either individually or in collaboration, to balance China independently of the United States. If that was the case, then the worst fears that the United States has with respect to Asia would be attenuated. Until the point where countries like Japan, India and Australia can muster the resources to assure themselves that they can successfully balance China, the best alternative for this part of the world is for U.S. rebalancing to be successful.